Nimbus, inc. offers an innovative provider of Wireless/Internet multimedia communication system, especially transmitting and receiving 1080p60 full HD resolution of video and high quality audio over the air. 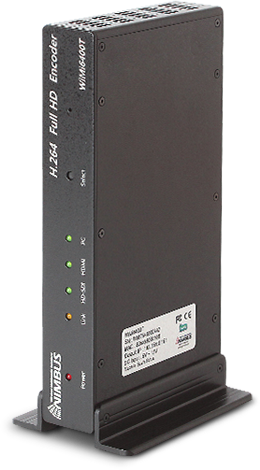 The company’s WiMi series of system represents near zero delay (within 30ms~80ms) H.264 HD encoder /decoder solution combining the ubiquity, flexibility and simplicity of the latest H.264 codec with the radio coverage of 900m at the line of sight. By embracing and pioneering the development of emerging technologies based on the latest H.264 AVC and H.265 HEVC codec solution, Nimbus, Inc. believes that its Wireless SDI/HDMI solution is the one of the most advanced of its kind in the evolving live video broadcasting, film shooting, live event, sports stadium and digital signage market. The company aims to meet the growing demand of convenient wireless multimedia environment by fulfilling customer’s long-awaited need for delivering HD contents over the air. Also, Nimbus, Inc. is struggling to develop 4k wireless video transmission system by H.265 HEVC with its near zero delay. Founded in November 2006, Nimbus, Inc. is privately-held and headquartered in Daejeon, South Korea. It is led by a team of accomplished entrepreneurs and engineers with proven industry track records and over 100 years of combined technical experience in Wireless/IP networking and broadband communications equipment. The company’s mission is to be the leading global provider of Wireless/Internet full HD/4k UHD streaming systems that will drive the next-generation ultra-high definition multimedia world. Copyright @ Nimbus. All rights reserved.